An area denial weapon or Anti Access/Area Denial (A2/AD) weapon system is a device or a strategy used to prevent an adversary from occupying or traversing an area of land, sea or air. The specific method used does not have to be totally effective in preventing passage (and sometimes is not) as long as it is sufficient to severely restrict, slow down, or endanger the opponent. Some area denial weapons pose long-lasting risks to anyone entering the area, specifically to civilians, and thus are often controversial. In medieval warfare, sharp and sturdy stakes were buried at the bottom of long lines of ditches, pointed end up diagonally, in order to prevent cavalry charges in a given area. Even if the stakes were spotted, soldiers would be forced to dismount and effectively give up their advantage as cavalry as well as becoming easier targets. The correct layout of these extensive lines of ditches and the quality control of stake size, form and placement was part of the craft of war. A more modern version, allowing quicker dispersal and providing the advantage of being hidden more easily, are caltrops, though items bearing close similarity (small balls with spikes) had been in use for most of antiquity. Many variants were also used, such as boards with metal hooks, as described during battles of Julius Caesar. Passive fortification—ditches and obstacles such as dragon's teeth and Czech hedgehogs—were used as anti-tank measures during World War II. 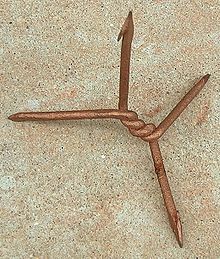 Simple rows or clusters of sharpened sticks (nowadays also known as punji sticks), and the use of small caltrops have been a feature of anti-infantry warfare since antiquity. However, due to the difficulty of mass-producing them in the pre-modern age, they were rarely used except in the defense of limited areas or chokepoints, especially during sieges, where they were used to help seal breaches. Increasing ease of production still did not prevent these methods from slowly falling out of favor from the late Middle Ages onward. Caltrops are still sometimes used in modern conflicts, such as during the Korean War, where Chinese troops, often wearing only light shoes, were particularly vulnerable. In modern times, special caltrops are also sometimes used against wheeled vehicles with pneumatic tires. Some South American urban guerrillas such as the Tupamaros and Montoneros, who called them "miguelitos," have used caltrops to avoid pursuit after ambushes. The most common are land mines of various types, planted by hand or dispersed by artillery. Some modern prototypes experiment with automatic guns or artillery-delivered ammunitions that are fired only after remote sensing detects enemies. 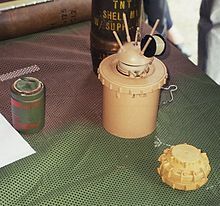 Booby traps or improvised explosive devices in sufficient concentration also qualify as area denial weapons, though they are much easier to clear and usually pose less long-term danger. During an armed conflict there are several methods of countering land mines. These include using armoured vehicles to negate the effects of anti-personnel land mines. Land mines can also be cleared either by hand, or by using specialised equipment such as tanks equipped with flails. Explosives can also be used to clear mine fields, either by artillery bombardment, or with specialised charges such as Bangalore torpedoes, the Antipersonnel Obstacle Breaching System and the Python Minefield Breaching System. 156 states are parties to the Ottawa Treaty under which they have agreed not to use, stockpile, produce or transfer anti-personnel mines. Other methods of area denial at a strategic level include aircraft carriers, submarines, surface-to-air missiles, ballistic missiles, cruise missiles, electronic warfare and interceptor aircraft. Various CBRNE (Chemical, Biological, Radiological, Nuclear, and Explosive) weapons can be used for area denial, as long as the agent is long-lasting. Fallout from nuclear weapons might be used in such a role. While never actually employed in this form, its use had been suggested by Douglas MacArthur during the Korean War. Anthrax spores can contaminate the ground for long periods of time, thus providing a form of area denial. However, the short-term (tactical) effects are likely to be low - the psychological effects on an opponent would likely be more significant. The massive use of defoliants such as Agent Orange can be used as an interdiction measure because they leave areas empty of any form of vegetation cover. In the desert-like terrain that ensues, it is impossible for the enemy to travel without being seen, and there is little cover in case of an attack, especially from the air. Many chemical weapons also produce toxic effects on any personnel in an affected area. However, this usually has no tactical value, as the effects of indirect exposure do not develop fast or substantially enough - though again, the psychological effect upon an enemy aware of the chemical usage may be considerable. There are however some chemical agents that are by design non-degrading, such as the nerve agent VX. Sulfur mustard (mustard gas) was extensively used by both German and allied forces on the west front in World War I as an effective area-denial weapon, usually through contaminating large land stripes by extensive shelling with HD/Gelbkreuz ordnance. Since sulfur mustard is very persistent, involatile, hard-to-decontaminate and highly effective in inflicting debilitating casualties at even low doses, this tactic proved to be very effective. To address some of the problems with land-mines (see § Drawbacks), weapons manufacturers are now experimenting with area-denial weapons which need human command to operate. Such systems are usually envisioned as a combination of either explosives, pre-targeted artillery shelling or smartguns with remote sensing equipment (sound, vibration, sight/thermal). By not posing a long-term risk, and by having some level of IFF capability (automatic or human-decision-based), these systems aim to achieve compliance with the Ottawa Treaty, as for example the Metal Storm ADWS (Area Denial Weapons System). As area denial weapons do not discriminate between friend and foe (or civilians) they make the affected zone hazardous for all trying to enter. Concepts for area denial weapons which do discriminate (by active sensing) have often been proposed, but have not yet reached a stage of general usefulness, due to their high complexity (and cost) and the risk of misidentification. Explosive-based area-denial weapons (mines) may be intentionally equipped with detonators which degrade over time, either exploding them or rendering them relatively harmless. Even in these cases, unexploded munitions often pose significant risk. ^ Jorge Zabalza historical leader from the MLN-Tupamaros urban guerrilla mentioned this use against official vehicles as a main tactic on book "0 from the left"
^ Kazianis, Harry. "Anti-Access Goes Global". The Diplomat. Retrieved 2011-12-29. ^ Ben, Ho Wan Beng (15 November 2018). "Are Aircraft Carriers Still Relevant?". The Diplomat. James Pach. Retrieved 14 January 2019. ^ Freier, Nathan (17 May 2012). "The Emerging Anti-Access/Area-Denial Challenge". Center for Strategic & International Studies. Retrieved 14 January 2018. This page was last edited on 30 March 2019, at 23:40 (UTC).